Ceramic Filters Market size was close to USD 900 million in 2015 and is expected to grow by a CAGR of more than 15.5% up to 2023. Regulatory bodies, in coalition with various institutions working towards ecological sustainability, conduct researches and set the regulations that are expected to catalyze growth. EPA, in collaboration with NSF, has set up regulations and standards to govern the drinking water filtration system, making the usage of efficient filters compulsory in all residential and commercial areas. 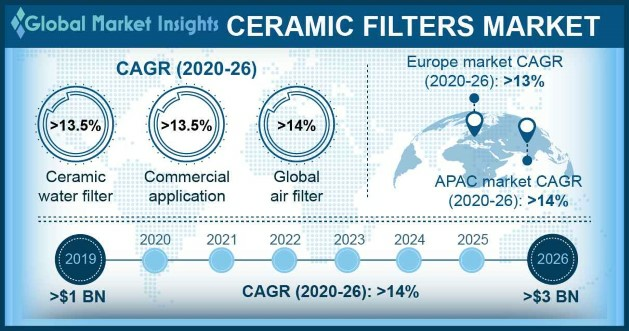 Such factors have a positive influence on the global ceramic filters market and will aid a healthy growth in the next few years.Rising government initiatives and norms by regulatory bodies including the EPA, ASTM, National Science Foundation (NSF), Energy & Environmental Affairs (EEA), REACH, European Environment Agency, etc. pertaining to residential as well as industrial filtration of waste water and air will be the major driving force for global ceramic filters market in the forecast period. These regulations compel product usage in order to follow the mandatory emission and sewage norms. Application for sewage water and slurry helps in controlling the biological oxygen demand (BOD) of the waste water before disposal in natural water bodies. They also clear the emission of any harmful pollutants before discharge into the atmosphere. Global demand is poised to increase substantially in the upcoming years due to worsening climatic conditions and growing environmental awareness. For instance, Clean Air Act, mandated by the EPA, lays out the regulations to protect the public from exposure to toxic gases. Superior mechanical and physical properties of ceramic filters in comparison with polymer filters will also be an important driving factor for global ceramic filters market in the upcoming years. Ceramic filters, being inert to most chemicals, are resistant to any corrosion caused by toxic chemicals. Polymeric materials witness the problem of organic fouling due to adverse reactions with certain chemicals including different fats, oils, and grease. Higher efficiency, owing to better cleaning capacity will require lesser number of filters to clean the same volume of fluid. Operation expenses, are thus reduced considerably by using ceramic filters. However, manufacturing is very capital intensive because of inconsistent supply and prices of volatile raw materials including titanium oxide, zirconium oxide, and aluminum oxide. This factor may affect the product price trends and hamper the global ceramic filters market growth. Water filters 2015 industry revenue was a little less than USD 500 million, while their air counterparts generated over USD 400 million for the same year. Several mandates and guidelines issued by regulatory agencies for water and air treatment and sewage disposal promote the adoption of environment friendly methods to save water and air quality. However, ceramic air filters market will have a higher growth by more than 15.5% CAGR up to 2023 due to the increasing carbon emissions and regulatory pressure on industrial and commercial sector to control harmful toxic emissions into the atmosphere will boost the product demand in the upcoming years. Residential applications had the maximum share accounting to over 40% of the global ceramic filters market. Residential purifiers are anticipated to be the major application for the forecast period. Rising demand in the African countries on the account of economic development of the region may be beneficial to the global market. Industrial ceramic filters market size was more than USD 300 million in 2015 and is anticipated to flourish by more than 15.5% CAGR in the next seven years. Industrial application is further segmented into hot gas filtration, fluid (oil or water) filtration, bio filtration and others. Hot gas filtration led the industrial application segment generating more than USD 130 million in 2015. Asia Pacific market, led by China and India, accounted for the maximum share with over a third of the global ceramic filters market size, recording a revenue more than USD 300 million in 2015. Global shift of the industrial developments towards this region will drive the regional product demand. Existing large scale industries in China and strict environmental norms is anticipated to support the market growth in the upcoming years. North America and Europe are projected to lose share to other regions due to saturation and developed economy. However, stringent regulatory norms will still positively affect regional growth. Middle East & Africa (MEA) ceramic filters market is expected to be greatly influenced by the petrochemical industries in the gulf countries coupled with the economic development and increasing awareness about safe drinking water and hygiene in several African countries. The region is expected to witness growth at more than 17.5% CAGR in the forecast period, taking the market size to over USD 150 million by 2023. Global ceramic filters market competitive landscape is comprised of manufacturers such as Glosfume, 3M, Doulton, Unifrax, Haldor Topsoe, ClearEdge, Pall Corporation, Tri-Mer, and Anguil Environmental Systems. Companies often exhibit significant amount of forward as well as backward integration in the product value chain. Glosfume Ltd., for instance, have a manufacturing facility for ceramics and other soluble elements to be used to manufacture the filters. They, however, rely on an effective distribution channel to supply their end products in the market. Ceramic filters market is a necessity based industry and is principally driven by the strict regulations and norms imposed by the government and other regulatory bodies. Growing environmental concerns and awareness about clean air and water discharge from industries as well as residential and commercial buildings for ecological sustainability has influenced the market. Candle filters are the most commonly used household ceramic filters for purification of drinking water. With increasing threat of global warming due to the industrial discharge of greenhouse gases, global ceramic air filter growth is also expected to be substantial throughout the forecast timeframe.